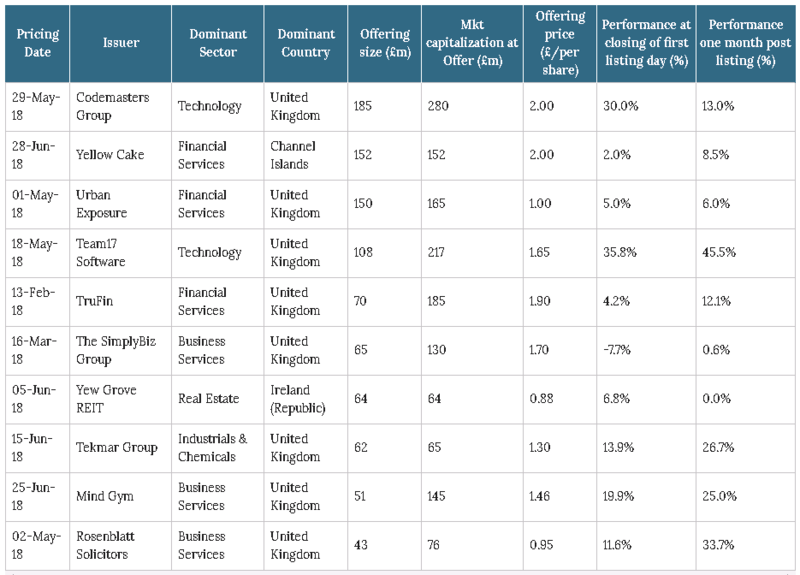 This exclusive ECM premium feature analyses the latest deals and upcoming pipeline on UK's London Stock Exchange AIM segment, combing through Mergermarket ECM data and proprietary intelligence. For more information on our ECM premium service, please email ecm@acuris.com. Investors might be drawing comparisons between this year’s listings in London and Brexit negotiations: achievements are sparse and not exactly impressive. But despite the gloomy main market score card, the Alternative Investment Market (AIM) has gone from strength to strength over the past year. It was popular with investors looking for genuine underlying growth in the low interest rate environment, head of AIM Marcus Stuttard said. Several AIM floats this year have offered good alpha, with the likes of Trufin [LON:TRU], behavioural science firm Mind Gym [LON:MIND], video games developer Team17 [LON:TM17] and law firm Knights Group [LON:KGH]. It has not always been this way. Problems surfaced around several AIM mining companies in 2009-11, but it did a lot to clean itself up after the credit crunch, said Berenberg’s head of UK ECM Chris Bowman. Increased regulation and professionalism across the LSE as a whole has benefited AIM, said Peel Hunt’s head of UK IPO origination Indy Bhattacharyya, who agreed that AIM had come a long way from bad press in the late 90s. Can AIM maintain its good run in the face of shaky IPO markets in Europe, as investors grapple with a potential trade war between the US and China, a financial crisis in Turkey and a very uncertain Brexit outcome? All market participants spoken to were upbeat about 2H18, with Dru Danford, head of corporate advisory at Shore Capital, saying it is better than it has ever been. Issuance on AIM is expected to continue to grow, with a potential bump in Q4 before Brexit in March 2019, according to Bhattacharyya. The quality of assets coming to market has improved, Bowman, Danford and Bhattacharyya agreed. There is a broader financing ecosystem and more capital raising options available to small businesses. “Companies choose to come to market because it is the right time, not just because it is the only form of equity financing available,” Stuttard said. Companies now also come to market better prepared. The ELITE programme, spearheaded by the LSE’s Borsa Italiana, guides smaller companies towards access to external capital and a contact network to help them scale up. So far in London, five ELITE businesses have listed: i-Nexus [LON:INX], Beeks Financial [LON:BKS], Van Elle [LON:VANL], SimplyBiz [LON:SBIZ] and IntegraFin [LON:IHP]. One IPO candidate talking to banks about a listing is eToro, which joined ELITE in April 2015. The Israel-headquartered social trading and investment platform has been valued at near USD 800m, on the high-end for AIM floats, which Stuttard said are usually around the GBP 500m-GBP 600m mark. Hybrid Air Vehicles, the blimp company responsible for the innovative aircraft Airlander 10 – also known as the “flying bum” - joined the programme in 2017. AIM has traditionally attracted many international companies, which are looking for access to a deep pool of capital from high quality global investors, said Stuttard. Many Israeli tech companies are looking at AIM as a viable listing venue, said Danford. Aside from etoro, GamyTech, ECI Telecom and smart digital textile garments maker HealthWatch Technologies are all considering London listings and could all go for AIM. Private equity firms are increasingly seeing an AIM float as a viable exit option, as they can do smaller deals earlier on, said Zeus Capital’s head of ECM Ben Robertson. Recent examples of PE-backed listings include i-nexus, Team17 out of LDC, fellow gaming business Sumo Group [LON:SUMO] out of Perwyn and VC-backed mobile payments player Boku [LON:BOKU]. Partial floats have become more common for PE exits, with good results, where they can sell down the residual stake in secondary markets, said Robertson. These deals benefit from increased liquidity and activity in secondary markets and shift the focus to long-term valuation, Stuttard concurred. AIM has had a mixed track record in terms of liquidity. But of the GBP 110bn raised on AIM since launch, about 60% has come from secondary offerings, Stuttard said. A liquidity-related discount on AIM listings compared to the Main Market is a thing of the past. However, AIM mining stocks still score lower than rivals at TSX Venture Exchange in Canada and ASX in Australia from a liquidity point of view, noted a natural resources fund manager. And some have still been of poor quality. There is little shareholder protection and hurdles for companies to get listed are higher elsewhere, meaning better quality options, he concluded. Stuttard disagreed, adding there is a trusted regulatory environment on AIM with a good level of disclosure. “AIM is not trying to be a zero failure operation, there will be some companies that don’t make it, while others will outperform the market by a large margin,” he said. At the end of the day, it is up to investors to decide. Though the offering sizes for mining companies have stayed around GBP 5m-GBP 10m, the average amount of funds raised in an AIM IPO has gone up from that level to over GBP 30m, Shore Capital’s Danford said. It’s not a matter of competition between AIM and the Main Market, Stuttard emphasised. For companies, it is often a size-related decision. Several AIM listings have grown from humble beginnings into multi-billion companies. Fever Tree [LON:FEVR], Boohoo [LON:BOO], Blue Prism [LON:PRSM] and AIM darling ASOS [LON:ASC] are all choosing to stay. There are benefits to moving to the main market, such as being taken up in one of the FTSE indices or moving to where peer group companies trade, Stuttard said. But there are also good reasons to stick with AIM. It is “less prescriptive”, Stuttard said, although it has a strong regulatory framework and similar levels of disclosure to Main Market-listed companies. Inheritance tax benefits for founders and investors alike may have something to do with it too. Most importantly perhaps, “some companies are concerned that if they move to the Main Market, they could be viewed as more mature, with lower future growth potential,” Stuttard said. It is also easier for companies to raise funds for growth on AIM for small to midcap companies, Bowman said. AIM’s higher average IPO valuation and offer size is largely a function of a sector shift. Historically, AIM has attracted a lot of mining and oil & gas companies, the advisers said. Recently, there has been a surge in retail and tech-labelled businesses, such as fintech, software, biopharma and property, they added. The gaming sector has also been busy, Robertson added. This year’s top 10 AIM IPOs illustrate the trend. 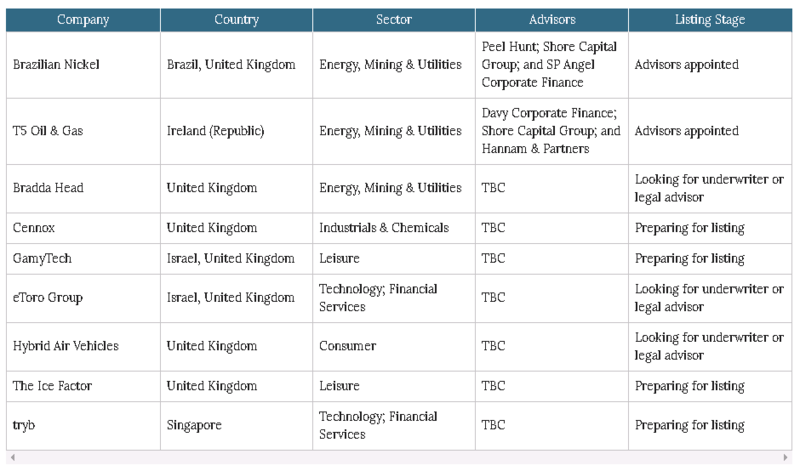 Looking at the pipeline, there is a broad spectrum of oil & gas, mining and metals companies such as Brazilian Nickel, Bradda Head and T5 Oil & Gas, as well as more tech-related enterprises, such as Zopa, eToro and Gamytech, and consumer companies, such as Notonthehighstreet and The Ice Factor. While UK retail is not the hottest sector now, most AIM-listed companies tend to be more innovative, online-focused, consumer companies, rather than brick and mortar, said Robertson. This has buffered them from the worst of the retail slump. None of the sources spoken to were particularly concerned about the effects of Brexit on AIM, aside from some possible short-term volatility. Brexit could be bad news for retail IPOs, Bowman admitted, but the long-term impact remains unclear and likely limited. “Europe has too few businesses using public equity financing markets and with the number of start-ups ever growing, London is still the first place they look to for capital,” Stuttard said. For big importers there could be an impact, Danford conceded, but added that one such company, which was heavily reliant on import, started sourcing and manufacturing more in Britain to cut costs. In the medium term, Brexit could boost certain parts of the UK economy.